Join us on a combination bus and walking tour to the historically significant locations that were instrumental in the origins of National Socialism as well as the German resistance movement. 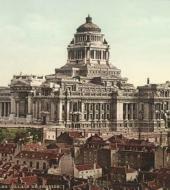 No other city is as closely tied to the rise of National Socialism as Munich. The NSDAP, or Nazi Party, was founded here in 1920 and quickly gained widespread popularity. At the same time, a few brave individuals recognized the dangers of the National Socialist Party and began to fight against it. One of the most famous resistance groups was the "White Rose" in Munich. Learn about the ins and outs of a movement that changed the world during a fascinating tour that will give you an inside look at Munich during this period in history.